Today I wondered what kind of Christmas cards Miss Marple would have chosen to send to her friends and family. 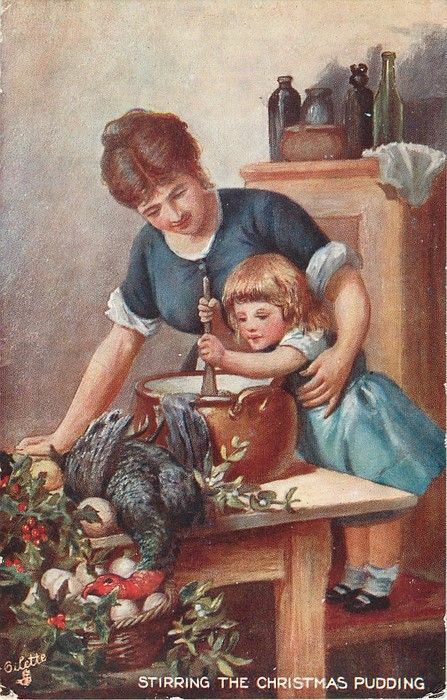 Perhaps she would have liked this vintage card- steeped in English Christmastime tradition and a charming portrayal of the stirring of the Christmas Pudding on the last Saturday before Advent. In England, a pudding is not like the American custard dessert. Christmas Pudding is closely related to a fruitcake. It is famously described in Charles Dickens’ A Christmas Carol.